I heard this morning that Mulberry Hall is closing, later confirmed by a statement on the company’s website. 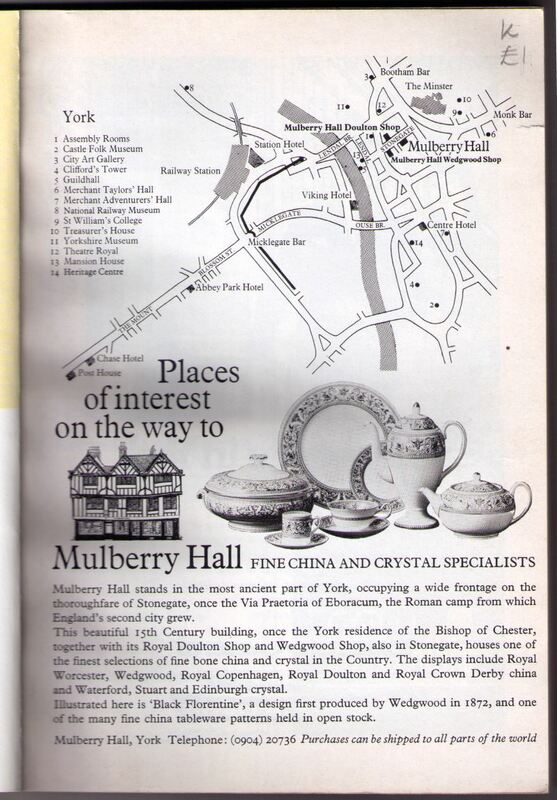 A page a couple of days ago included an ad from one of the old guidebooks I have, and before they’re put back on the shelf it seems appropriate to include the advertisements for Mulberry Hall, so prominent in those publications. The one above is from a guide apparently dating from the early 1970s. The advert features well-known names: Royal Doulton, Wedgwood, Spode, Waterford. I’ve got three of these guides, from the early 1970s, late 1970s and early 1980s. 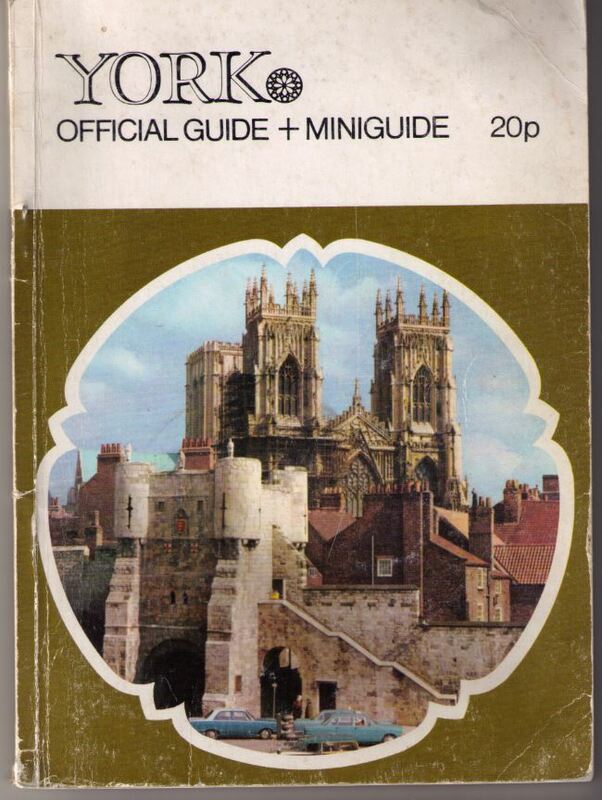 They’re the ‘Official Guide’, published by the Lord Mayor, Councillors and Citizens, it says in the front. Alongside information on the city’s history and tourist attractions are many pages of adverts, as you might expect. I imagine it cost quite a lot to advertise in these ‘official guides’, particularly on their most prominent pages. Every edition I have has an advert for Rowntree Mackintosh Ltd on the back cover, a full page, in full colour. Apart from the back cover the most prestigious place for ads would be the first page you saw when you opened the front cover of the guidebook. This, in my three editions, is an advert for Mulberry Hall. Looking at the map illustration I was struck by the fact that at this time Mulberry Hall appeared to have three separate shops some distance apart: the main shop on Stonegate, then also a ‘Doulton Shop’ and a ‘Wedgwood Shop’ in different premises further along the street and opposite. My quick online research suggests that the Doulton shop in Stonegate opened in 1974 and the Wedgwood one in 1978/9. The original shop seems to have expanded in size so perhaps these were all brought together into the one location since. Records available online show that earlier this year two planning applications were submitted, one for listed building consent for subdivision of the shop at 17-19 Stonegate into 3 commercial units (appears to be essentially putting them back to how they were), and one for a change of use for the Little Stonegate part – from retail to restaurant/bar. This application was later withdrawn. There are already many comments on the Press website offering theories and opinions on why the shop is closing: it’s the fault of the council, in approving out of town shopping schemes, or it’s because of parking charges in the city centre, or too much traffic in the city centre, or pedestrianisation of the city centre. Many people are saying they’re ‘shocked’. 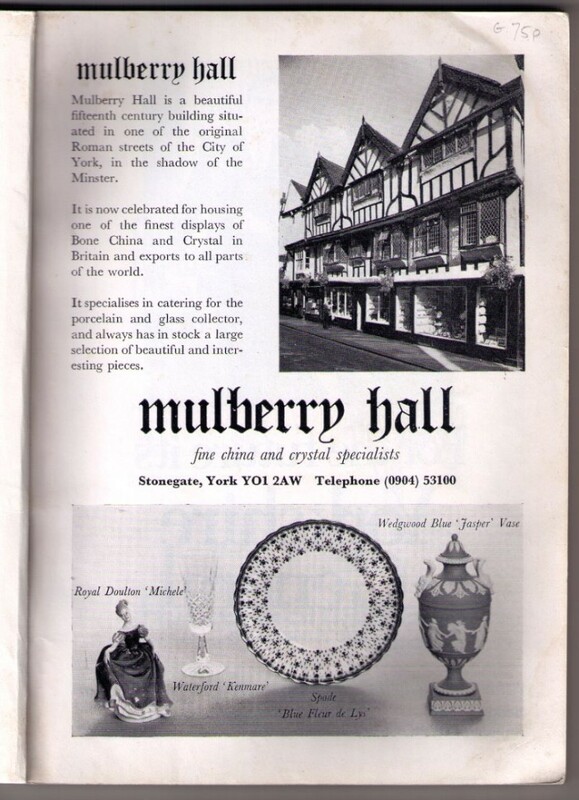 I wonder how many of the shocked people regularly shopped in Mulberry Hall? We so rarely look to ourselves? If the city centre shops are to stay open then we need to spend more money in them, don’t we. But perhaps sometimes things have just had their day, and tastes change, and younger generations don’t shop at the same places their parents shopped. I’ve never bought anything at Mulberry Hall. I have a set of plates in the cupboard that I think came from there, a moving in gift, many years ago. They’re lovely to look at, but they’re too posh to use, so I use the plain white cheap ones instead. 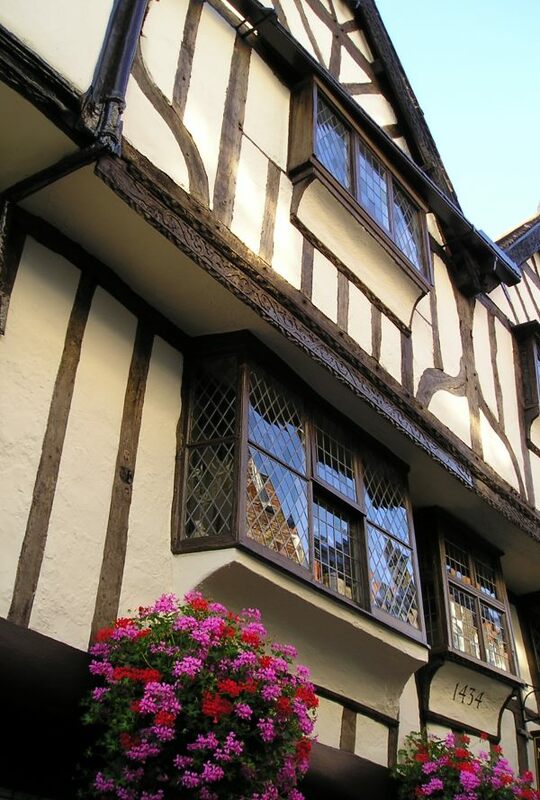 … once we’d seen the Minster, we walked over to Stonegate St.—a very nice pedestrian area. When we were here four years ago, Margaret bought her Spode china at Mulberry Hall on Stonegate St., and I got some very nice bone china coffee mugs which I like very much. I got two more today and also a thimble for my collection. I found the quiche dish in the quince pattern that Nancy Thuma wanted too, at Mulberry Hall’s Wedgwood shop, so I got that too. If you knew the shop well and would like to add information, memories and thoughts, comments are welcome below. Before Mulberry Hall, the premises used to be the York Coffee House. I can remember many visits there to enjoy the experience of frothy coffee served in glass cups. The sight of the Italian machine producing this steam was, to a youngster, awesome. Much more exciting than Betty’s or Terry’s! The rear of the property was the Stonegate Grill. Not just a restaurant but a new idea in classy eating experience, very upmarket. Definitely more stylish than Berni Inns on Blossom Street. Stonegate Grill catered for the Theatre clientele.